This entry was posted in Collaboration, Otome Games, Sengoku Night Blood and tagged Kadokawa, Marvelous!, Mobile, Otomate, SNB Shingen. Will you follow me to my world to get you cured? For me, this time ended kinda happy even he mention medicine. But yeah, smile and laugh are the best medicine, both for physical and mind. But Shingen, don’t forget to keep your health first~! I’m sure there’s tons of smiles and laughs in Takeda army ;3;/ Shingen is in good hands with his retainers. Haha, is that a Fairy Tail song? Kakihara is a really good singer though! 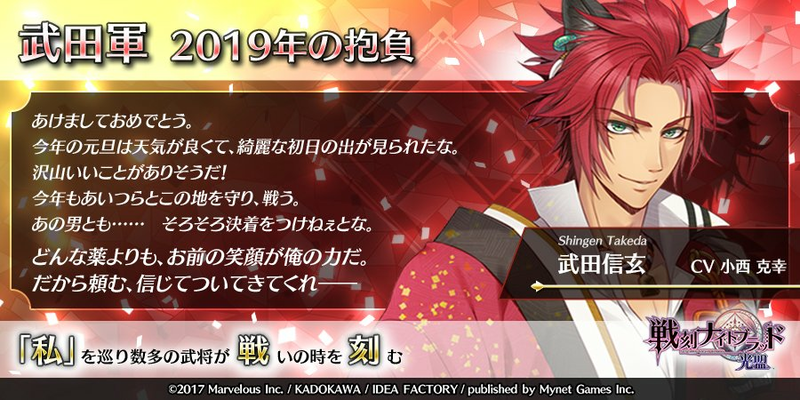 I just smile on his resolution because he is the Shingen he always be and those words with his beloved rival that makes forgot about his illness even though there’s a word medicine. Aw, your comment here is so sweet about Shingen and it’s so true. He’s very pragmatic about his illness but it doesn’t keep him down either and he’s always looking forward + wanting to compete with his rival. Shingen’s drive is probably one of the brightest in Shinga :’)). And that man… I need to settle things soon. Your smile is my strength more than any kind of medicine. It goes to show just how much his rivalry with Kenshin means to him LOL equal to, if not more, than unifying the country (which is what all the other men mention). LOL Shingen’s tragedy marker strikes again because he’s constantly bringing up things you don’t want to hear.